Last night, the finals of The Defense, the massive JoinDota league that’s brought some of the biggest names in competitive Dota 2 together, took place between Complexity Gaming and Mousesports, leading to a four game series that ended with Complexity taking the win three games to one, and netting them a tasty €6,000 prize. Watch the entire match here if you don’t want things spoiled too much. It was a series that never really looked like Mous were in control of, and even going into the fourth game, where they’d managed to grab a win and were playing to stay in, they were looking not so much shaky as a little bit deranged. After being consistently shut down by Nature’s Prophet throughout the series they avoiding banning him outright in the first set of bans, instead opting for Naga, Dark Seer and Lone Druid, all solid bans, but still odd considering previous games. That said, grabbing Leshrac and Morphiling, with a Sand King to initiate is a pretty nice composition but up against Tidehunter, Venomancer and Nature’s Prophet isn’t exactly ideal. Rounding it off with a completely left-field pick of Ogre Magi and Jakiro just seemed a little bit insane, especially when Queen of Pain and Disruptor popped up on Complexity’s side. The real problem was the trilane that they opened the game with. Sand King, played by Mous’ Bamboe held his own well against Complexity’s Hannah Montana, playing Tidehunter, on top, but with Ogre Magi, Leshrac and Jakiro going up against Queen of Pain, Venomancer and Distruptor on bottom they just couldn’t hold their own and by the ten minute mark they were down thousands of experience and gold after a series of failed ganks and backfiring pushes. Things didn’t really improve after those ten minutes, and while Mous got some really excellent teamfights once Bamboe got a Blink Dagger to drop his Epicentre hard in the middle of a fight, it just wasn’t enough to reverse that initial snowball, that just continued to keep a massive gap between the two teams. With Ogre Magi being such a late game hero, the fact that he was shoved on a tri-lane where he was experience and gold starved, with hardly any kills or supports coming his way, meant that Singsing was all but useless the entire game, just popping off the occasional stun. Jakiro had a similar problem, played by Mous’ 1437, but the difference was the hero has an multistun with his double breath, which gave him a little utility. 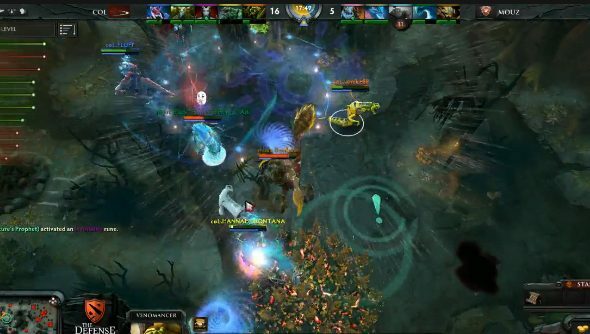 By the end of the game Mous’ only hope was in Morphling, played by Black, who was well fed and well farmed, but you can’t hang the entire hope of a team on one player, especially when Complexity wisely invested in both Pipe of Insight and Mekansm, which gave them something close to immunity from Epicentre, both lessening the damage and giving them a nice boost of health. With their main teamfight neutralised, Mous just faded, completely resigned to defeat by the half an hour mark. And with that, Complexity won The Defense. We’ll just have to see if Mousesports can get that Ogre Magi/Jakiro synergy working by the time The International rolls around at the beginning of September.